Joe Caslin’s beautiful large scale artworks have garnered global recognition. JOE CASLIN’S WORK hit a national spotlight in 2015 thanks to a mural called the Claddagh Embrace. 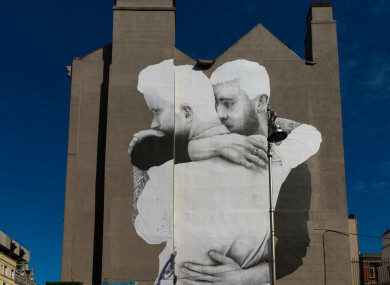 The image of two men embracing on the side of the Rick’s Burgers building on Dame St became something of a visual icon of the #YesEquality campaign, despite being washed off within a few days thanks to rainfall. The Roscommon born artist uses his art as a means to encourage public engagement with murals relating to mental health, direct provision, drug legislation and more. Caslin’s large-scale photo-realistic portraits, usually wheat pasted onto buildings, have covered walls at Trinity College, Collins Barracks and more. Here are 7 Caslin creations you may have spotted around Ireland – and beyond. #joecaslin #rootbeforewerise #decorativeartsandhistory #nationalmuseumofireland #dublin #ireland #eire #history #arts #fineart #collinsbarracks #historyofireland | ROOTBEFOREWERISE | "These two figures are positioned close to the earth. They are connected to the ground beneath them and connected to each other in a pose of mutual support and dependency. Should one move, the other would fall. Even in their crouch, they are poised to rise. Brothers in arms. The pose suggests the importance of being grounded and taking time out to consider the world around you. We are gifted a moment of stillness amid the incessant pace of the world. Their mutual dependence and support is a symbol of our human need for connection in this complex and fractured world. We need to hold one another, comfort one another, mind one another and be present with empathy and compassion for one another. We need to root before we rise." Email “Remember this 2015 #YesEquality mural? Here are 7 more of Joe Caslin's creations”. Feedback on “Remember this 2015 #YesEquality mural? Here are 7 more of Joe Caslin's creations”.